Preheat the oven to 180°C. Place the carrots onto a small roasting tray and sprinkle over the cumin and olive oil. Roast in the oven for 20-30 minutes, or until tinged golden. Place the roasted carrots, chickpeas, tahini, lemon juice and 50 g of the California walnuts into a food processor and blend until smooth. Add a splash of water as per desired consistency. Season it with salt and pepper. 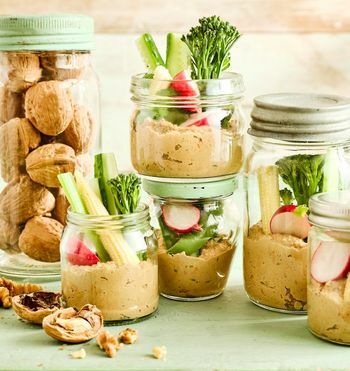 Spoon the hummus into your chosen container, then top with the olives, preserved lemon slices, coriander and leftover California walnuts. Drizzle over some extra olive oil.